A teaser for the animated adventure Happy Family was released a couple months ago and now the sparkling full trailer has dropped. It concerns an unhappy family that is transformed into monsters. The English voice cast is stellar: Emily Watson, Jason Isaacs, Nick Frost, Jessica Brown Findlay, Celia Imrie and Catherine Tate. The Wünschmann family isn't exactly a happy family. Mother Emma encourages the family to put their differences aside by taking them to a theme park. After a harmless joke with a doll, which turns out to be the evil witch Babayaga, the Wünschmanns are transformed into monsters. 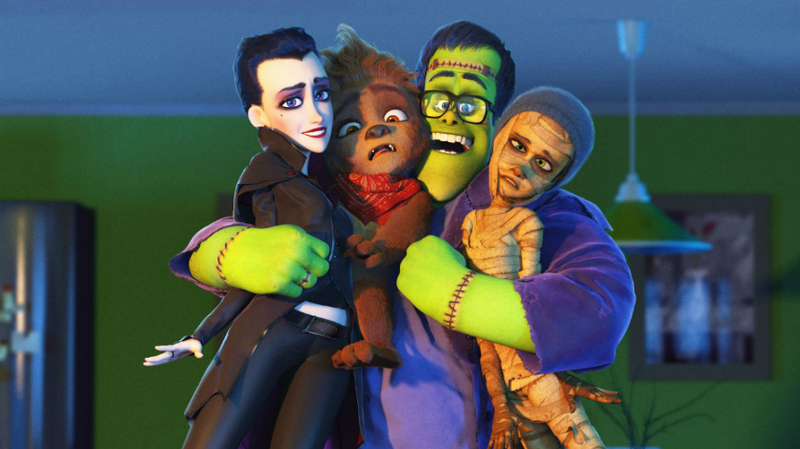 Mother Emma turns into a vampire, dad Frank becomes Frankenstein, daughter Fee turns into a mummy, and son Max winds up being a warewolf! And that's when a normal ride on a ghost train turns into a ludicrously spooky adventure. Will the Wünschmann family find their happy ending? Below we have the teaser (in English); the full trailer, voiced in German (due out in Germany on August 24); and the full trailer, voiced in Spanish and retitled La Familia Monster (coming soon).